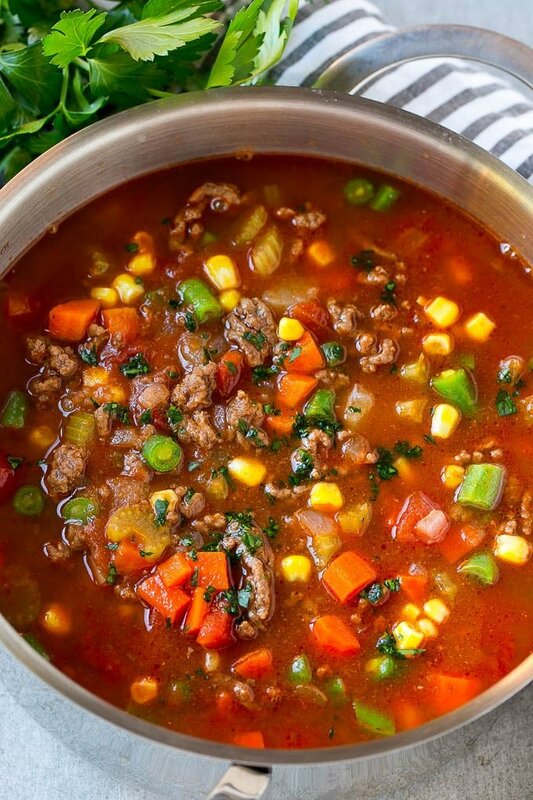 This hearty hamburger soup is loaded with potatoes and vegetables, all in a savory broth. The perfect easy dinner option that the whole family will love! Got ground beef? 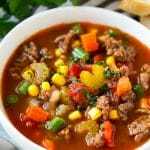 Then you must try this hamburger soup. It’s quick and easy to make and just loaded with flavor – it’s a great way to get your kids to eat their veggies too! Sometimes I find myself with a pound of ground beef and no clue what to make with it. It’s times like that when I turn to hamburger soup- it’s satisfying, quick, and you can customize it with whatever ingredients you already have around the house. 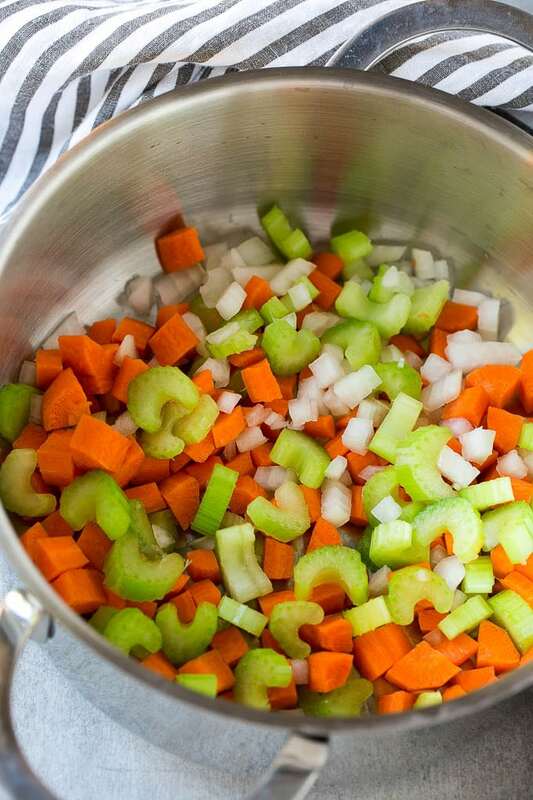 This soup starts with the classic base of onions, carrot and celery. The veggies are sauteed until softened. After your veggies are done, the hamburger goes into the pot to brown. 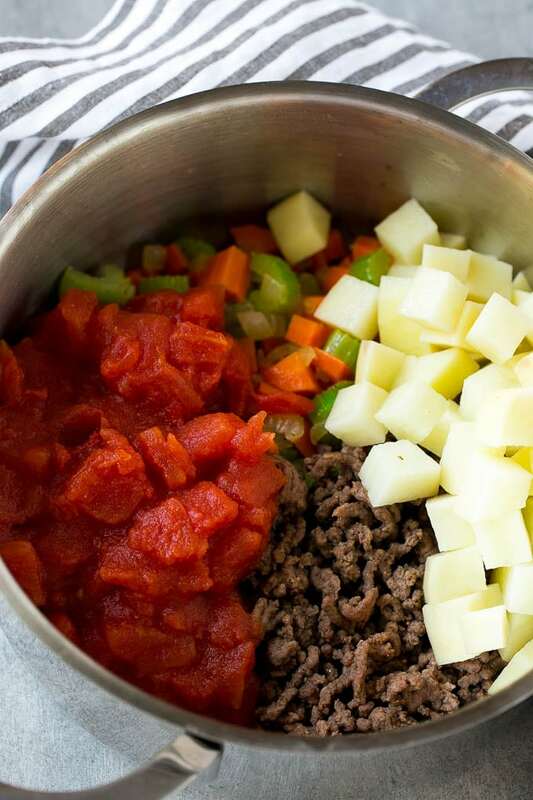 I use a 90% lean ground beef, it’s got plenty of flavor but doesn’t make the soup greasy. If you’re using beef with a higher fat content, you’ll want to drain off any excess fat before you move to the next step. After the meat and veggies are ready, I add tomatoes, tomato sauce, potatoes, beef broth and herbs to the pot, then bring the whole thing to a simmer. The smaller you cut your potatoes, the less time it will take for this soup to cook. I cut mine into 1/2 inch cubes and it typically takes about 25 minutes for the potatoes to soften. The final step is to add in a few more veggies. I use a handful of frozen corn and some chopped green beans. I use fresh green beans, but you can absolutely use frozen if you prefer. The key is to add them at the end of the cooking time so that they don’t get mushy. 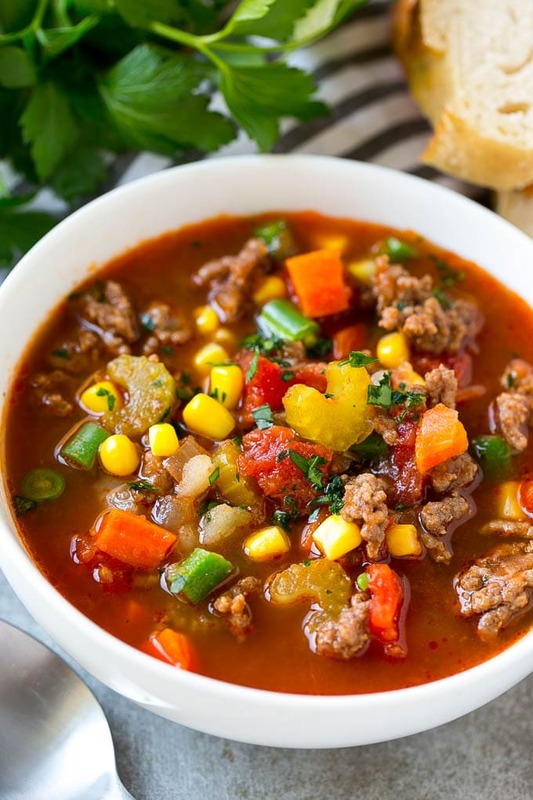 This hamburger soup is hearty enough to stand on its own as a complete meal, but I often serve it with some crusty bread because it’s such a nice complement to the soup. What’s your favorite way to use hamburger meat? 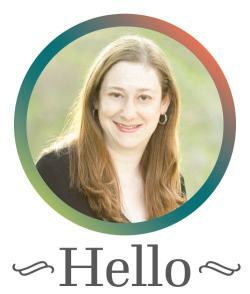 I’d love to hear your ideas in the comments! Heat the olive oil in a large pot over medium high heat. Add the onion, carrots and celery to the pot. Cook for 5-6 minutes or until softened. 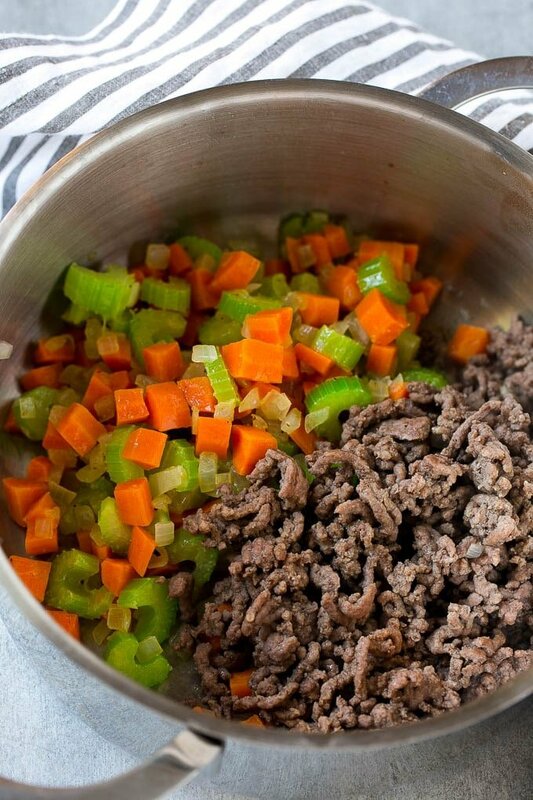 Add the ground beef to the pot and season with salt and pepper to taste. Cook, breaking up the meat with a spoon, until browned and mostly cooked through. Add the garlic and cook for 30 seconds more. Add the tomatoes, tomato sauce, Italian seasoning, beef broth and potato to the pot; bring to a simmer. Cook for 25-30 minutes or until potatoes are tender. Taste and add salt and pepper as desired. Stir in the corn and green beans and cook for 5 minutes more. Sprinkle with parsley and serve. If you use ground beef with a higher fat content, be sure to drain off any excess fat before you proceed to the next step. Ground turkey (93% lean) can be substituted for the ground beef. Sounds delicious! What would you recommend I serve as sides to round out a complete meal? I serve this with bread or a green salad! I especially love the green bean addition I bought fresh and I think it adds the perfect kick! Delicious soup! I would suggest using petite chopped tomatoes, as the tomatoes seemed a bit large. Also, I would suggest draining the meat after it cools. Very taste soup overall! Great recipe! I added a bit of Worcestershire. I will def make again some day. So happy to hear that you’re enjoying the recipe, thanks for reporting back! Awesome recipe very good. Thank you. Really good start. I felt it lacked a savory component; it needed a little depth. I ended up adding a tablespoon of soy sauce which added that missing piece and made all the difference! Thanks! Can this be made in slow cooker? Yes it can! You’ll want to brown the beef first, then add the beef, onion, carrot, celery, garlic, seasonings, tomatoes, tomato sauce, beef broth and potatoes to the slow cooker. Cook on low for 4 hours, then stir in the corn and green beans right before serving. I have four kiddos in my zoo, and they all love soup. I like this one especially because o the simple ingredients for my 10 month old. I have also omitted the potatoes and added elbow macaroni. “This is sooooo good,” said the 7 year old. Thanks for the inspiration! So happy that they all enjoyed it! Thanks for reporting back! When should I add noodles with this recipe in a slow cooker? During the last 20-30 minutes of the cook time! We add spicy V8 juice in combination with the beef broth…. Yummy! Adding a Tablespoon or so of Asian fish sauce, or light soy, adds umami and makes it yummier still! This is a wonderful recipe. I made it twice, once with ground beef and again today with a cut up chuck steak. This time added baby limas, very few noodles and 5 shredded Brussels sprouts. Delicious. Thank you! I love this soup! It’s also called vegetable soup. I also add black eyed peas and baby Lima beans. A friend told me the other day that her aunt brings everything to a boil then adds uncooked hamburger. Then she simmers until done. it holds the hamburger’s flavor better. Love the idea of adding beans, I’ll try that next time!